Brentwood’s AccuPac® Cross-Fluted Cooling Tower Film Fills improve water distribution by splitting the water stream as it descends through the cooling tower fill pack. The counterflow film fills feature a bonded edge with dedicated bond points for added strength and durability. The high thermal performance and low pressure drop are balanced by utilizing the engineered microstructure design and maintaining the highest manufacturing standards. Brentwood has spent millions of dollars in R&D and testing of all cooling tower fill and drift eliminator products over the years, collecting results from thousands of high-performing installations. Whether your needs are for counterflow or crossflow tower applications, we can provide educated recommendations for the correct fill replacement to meet existing design criteria or improve upon older tower installations. Cross-fluted fills offer the highest level of efficiency of all film fill designs, improving heat transfer and maximizing overall tower performance. 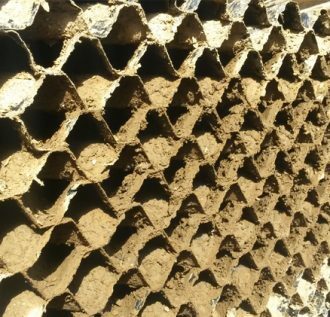 The engineered microstructure incorporated into cross-fluted fills enhances water distribution and thermal mixing. Brentwood’s cross-fluted fills feature bonded edges for added media strength and durability. Beveled tips are incorporated into the cross-fluted design to promote drainage at the fill pack interfaces.